The start of a new year is the perfect time to think about buying a new home or remodeling the one you’re in. Either way, it’s time to spruce up on the 2018 design trends to make your home a stand out. In 2018, homes are expected to be bolder than they’ve been in the past, with big floral prints, vibrant hues, and concrete décor. If you’re ready to refresh your home, here are 6 of the biggest design trends to try in 2018. Ultra violet was recently named Pantone’s 2018 colour of the year, which means it’s going to be popping up everywhere in home design and décor. The deep dramatic shade works best as a pop of colour throughout your abode. Whether it’s a velvet ultra violet arm chair for your living room, a Moroccan-style rug with the royal hue spread throughout, or throw pillows for your bed, ultra violet is the perfect way to make a statement in your home. What’s old is new again. Vintage lighting fixtures like aged copper pendants, Edison-style bulbs, and antique chandeliers are making a serious comeback in 2018. Whether you hang them in your kitchen, bedroom or living room, use vintage lighting to add a twist in your modern or retro home. They add a cozy feel to your space and are easy on the eye. While concrete used to be seen as mainly a building material, it’s going to be making more appearances as décor inside the home. From gorgeous concrete floors, to concrete island tops, to concrete accessories like plant pots, prepare to see much more of this industrial material used creatively throughout the home. Bold floral prints with contrasting colours are going to be big in 2018. Floral is a trend that always seems to be around in different styles, but expect to see huge blooms in decor this year. Whether you opt to go bold with a floral mural behind your couch in the family room, make a statement with a floral arm chair, or keep it simple with floral art prints around your abode, there are lots of ways to incorporate this pretty design trend. 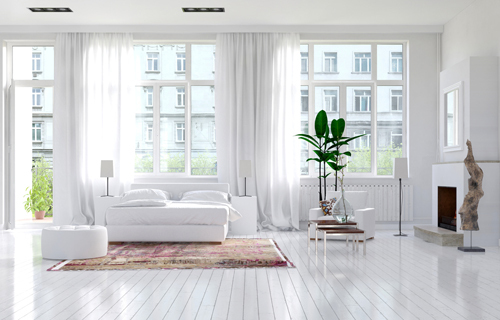 Your bedroom should be a relaxing space that feels like a calming oasis. It’s difficult to evoke that feeling with big furniture and ornate décor fixings. 2018 will see more casual sleeping spaces with minimalist furniture and neutral shades. Think: Lots of white, greys and warm wood tones, as well as earth tones like tobacco and camel. Adding more colour to your kitchen can give it more personality and warmth, while keeping style in mind. The kitchen is often the heart of the home, and sets the tone for the atmosphere of the rest of the home design. For 2018, kitchen colour trends will range from natural neutrals, to sage, to vibrant and bold choices like deep blue. What design trend are you most excited to try this year?